Home › Analysis › PSG vs APOEL : Highlights and Players Ratings. PSG vs APOEL : Highlights and Players Ratings. Edinson Cavani (PSG): On target ! 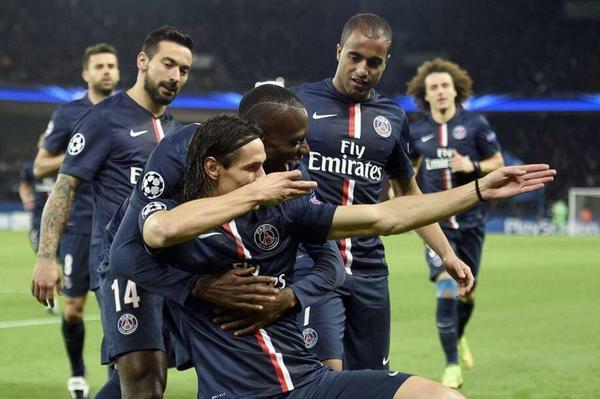 Fifty seven seconds to score and qualify for the knockout stages of the Champions League, did PSG do the job? Being qualified already, is very good news for the Parisians, but if the club want to finish first of their Group, they’ll need a victory in Barcelona’s castle of Camp Nou. Since Zlatan Ibrahimovic’s injury, PSG’s firing force has considerably weaken; Cavani mistfired several times and not only in yesterday’s game ! Laurent Blanc’s squad ensured the essential, but it was plain to see that the players were already focused in their next Ligue 1 fixture versus Olympique de Marseille currently sitting first on the League Table. So, which players were good and which ones were bad ? Unstopable during the whole game, he gave lots of headache to his opponents. Best Parisian, he created several good chances (28th, 32th) and demonstrated his world-class technical ability. Subbed at 86th (Cabaye) he left the pitch under a standing ovation, from the club’s supporters. Quiet evening for the Italian goalkeeper; he reacted well in the 12th minute versus the sole Cypriote chance and generally stayed an attentive spectator of the game. His assist for Cavani’s goal, was perfect; he defended well and he was also interesting going forward, against a weak Cypriot team. Nice interact with Lucas. Another good solid game, for the Parisian Captain. Nothing exceptional, but he was well concentrated and always available for his teammates. A uneventiful game, for the former Chelsea player; his constant aggression permitted his teammates to go forward and enjoy a quiet evening. Not his best performance, so far; quite good defensively, the former Barcelona’s player, didn’t convince, for he wasn’t able to help the team to create chances to score. Not very convincing in Ligue 1 games, the Italian international was “the boss” of the Parc des Princes midfield; he exploited cleverly his opponents weaknesses and gained many duels. He was the mastermind of the pitch and good in defending, when needed. Good game, for the french international; generous in finding solutions for his teammates, proposing game alternatives to help the squad go forward and creating several chances with his accomplice on the pitch, Javier Pastore. Another good game from the Argentinian international; PSG’s player in form, since the beginning of the season, he was brilliant on the pitch, at last free to go where he was needed the most.He offered some very good opportunities to score and he almost scored a wonder-goal (60th). Scoring only after 57 seconds, made him the quickest goalscorer of the club, but afterwards the Uruguay’s international, lost his accuracy many times (17th, 37th, 56th, 79th …) It’s clear that Zlatan’s absence doesn’t help. ‹ The Lamela Enigma: Spursed ?